Formula Renault BARC is doing really well to gain big grids this season. Rockingham in Northamptonshire welcomes the Protyre Formula Renault BARC Championship this coming weekend, 19th/20th May, for the second race meeting of the 2012 season with an expanded grid set to contest the fourth and fifth rounds of the campaign. While an outstanding 25 cars lined-up for the season-opener at Snetterton last month, confirming Protyre Formula Renault BARC’s position as the healthiest and most popular series of its kind in the UK, an even bigger field of drivers is expected at Rockingham. MTECH Lite, which already runs two cars for Sean Walkinshaw (Chipping Norton, Oxfordshire) and Mexican racer Jorge Cevallos, will double its entry this weekend after signing Lebanese divers Joe Ghanem – the reigning Formula Gulf 1000 Champion – and motorsport rookie Shahan Sarkissian. Ghanem, who has been competing in the Middle East for the last few years, is a familiar face to the British motorsport scene having previously competed in the Formula Renault Winter Series in 2007 before graduating to British Formula 3 where he was a podium finisher in the National Class. Former champion team Hillspeed, meanwhile, is working hard to finalise a deal to have a third driver on the grid for Rockingham to partner Marcus Allen (Moreton-in-Marsh, Gloucestershire) and Jacob Nortoft. Through its work with Nortoft, the squad has actually become an official partner of the Dansk Automobil Sports Union as part of the Danish federation’s talent development programme. Delivering consistently strong performances across all three Snetterton races last month, taking one victory and two further second place results, MGR Motorsport’s Josh Webster (Stowmarket, Suffolk) heads the championship standings going into rounds four and five by 14 points. With his deal to return to Protyre Formula Renault BARC this year incredibly last-minute, due to the shelving of Formula Renault UK for 2012, Webster had zero time to prepare prior to the first three rounds but his experience shone through. “Everything was so rushed for Snetterton, it was touch and go whether we’d be on the grid at all and the MGR guys had to get the car built in just a couple of days so it was pretty manic”, commented Webster, who currently holds the Rockingham lap record, “To achieve what we did, with no testing and only a base set-up, was fantastic and all credit to the hard work of the team. In the same boat as Webster with regard to having had no pre-season preparation was two-time McLaren Autosport BRDC Award finalist Scott Malvern (Barkingside, Ilford). His star quality was clear to see though, overcoming several mechanical glitches to take an excellent first win on his series debut and third in the points standings for the Cliff Dempsey Racing with Cullen Motorsport squad. Fortec Motorsports’ Seb Morris (Marford, Wrexham) was a revelation on his maiden weekend racing single-seaters, the 16-year-old dominating qualifying by taking all three Snetterton pole positions and also going on to take a debut win in round two. He will arrive at Rockingham four points ahead of Malvern while MGR’s David Wagner (Glasgow) is just two points further adrift in fourth place after a superbly consistent season-opener. Impressive first time podium finishers Macaulay Walsh (Northampton) and Jake Dalton (Stoke-on-Trent) are fifth and sixth in the standings respectively for Scorpio Motorsport and MGR. 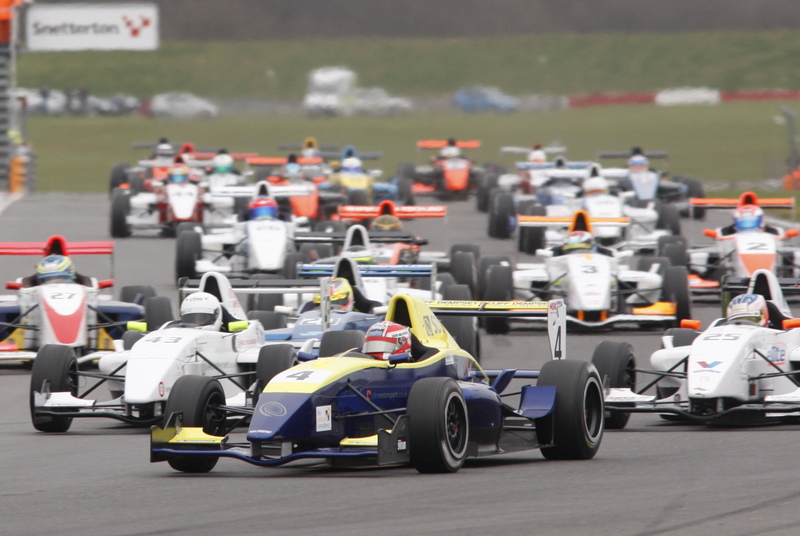 Qualifying for rounds four and five of the 2012 Protyre Formula Renault BARC Championship will take place at 09.30 and 12.10 on Saturday, 19th May, with both races set to follow on Sunday, 20th May, at 10.55 and 15.35 respectively. Along with headline sponsor Protyre, Formula Renault BARC is additionally supported by Michelin, The Lubricant Consultancy, Petronas Syntium and NGK Spark Plugs. Watch Porsche Action on TV this week.